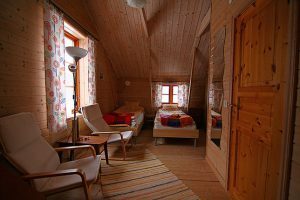 As a guest at Sågknorren, you can choose a room with full hotel standard at the Inn, a room in the luxury Hostel or your own Cottage. All accommodations have a seating area and a private bathroom. In the Hostel and Cottages you have access to well-equipped kitchens. The Inn and Hostel include free Wi-Fi. In Cottages, Wi-Fi can be rented. You can also reserve room directly via pensionat@sagknorren.se.